Download my two-page checklist as a PDF or as a Word Document. If you are going on a flight with passengers, the law states that you must give them a safety briefing. Since I couldn’t find anything that fully met my needs, for a Cessna 172, I put together my own safety briefing. In case anyone else finds it useful, I have published it here. DISCLAIMER: I am not an expert, or a qualified flight instructor, I am just a PPL. Nothing here is official, and some or all of it might be incorrect! You completely use this at your own risk, and must use your own intelligence and judgement at all times when flying and when speaking to your passengers! If in any doubt, seek the advice of a qualified flight instructor. I keep getting message ‘delete some files’ as there’s a memory [disk space] problem with my laptop. Which files would you delete? I would delete the biggest files first! Don’t delete anything in your Windows directory though, or Windows might stop working. You can bring up Windows Explorer and sort by file size. I’d look in your downloads folder first. Any video is likely to be large. Sounds files can also be quite large. “It’s absolute rubbish that Ronnie O’Sullivan says the rest of them [the lower-ranked players] shouldn’t be professionals. You’ve got aspirations as a young player coming through. OK, you might not be good enough at the moment, but you practice hard, do like Mark Selby has done, like Stuart Bingham has done, and all of a sudden you improve your standard, you could be one of the players who gets through and makes the money. “You can’t say the player who’s ranked 120th is wasting his time, because the player ranked 120th is NOT wasting his time: he’s got a dream. Ronnie O’Sullivan doesn’t have any dreams any more, he prefers to do other things; his dream is not snooker. Emphasis is mine. BBC Television, 15th January 2017. Try not to travel alone. It’s safer with a friend. Wait for the Uber in a safe place. This is likely to be indoors, or in a well-lit public place, not on a dark street. Ask to be dropped off in a public place too, if possible. Check the driver’s star rating. If the driver assigned to you has a bad rating, you can cancel before they arrive, and choose another option. Verify the identity of the Uber driver. The app gives you the driver’s first name, a photo of them, and a photo of the vehicle and its number plate. Make sure you get into the right car! If you don’t feel comfortable with the driver, don’t get in the car. Check the condition of the car. If there are flat tyres, funny engine noises, or something doesn’t feel right, don’t get in. Take a photo of the car, showing its number plate, and send it to a friend before you get in. If you don’t have any friends on with you on holiday, send it to somebody back home. Tell people where you are going. If you are meeting friends, the app lets you share your trip details and time of arrival. Your friend can then track your car along its route. Don’t sit in the front passenger seat. This makes physical contact between you and the driver more difficult. Put your seatbelt on, just in case you are in an accident. Tell the driver that you are meeting somebody at the other end. Knowing that someone is expecting you to arrive could make them think twice about causing trouble. Prepare for an easy escape. Make sure your car door is unlocked, and keep all your belongings (including your phone) close at hand. Keep your phone in your hand, in case you need to send a message asking for help. Keep it friendly. Don’t discuss contentious topics or get into an argument with the driver. Keep an eye on where you are going. Look out for landmarks, places, and look at a map on your phone to check you are heading in the right direction. Here is the Uber safety statement. 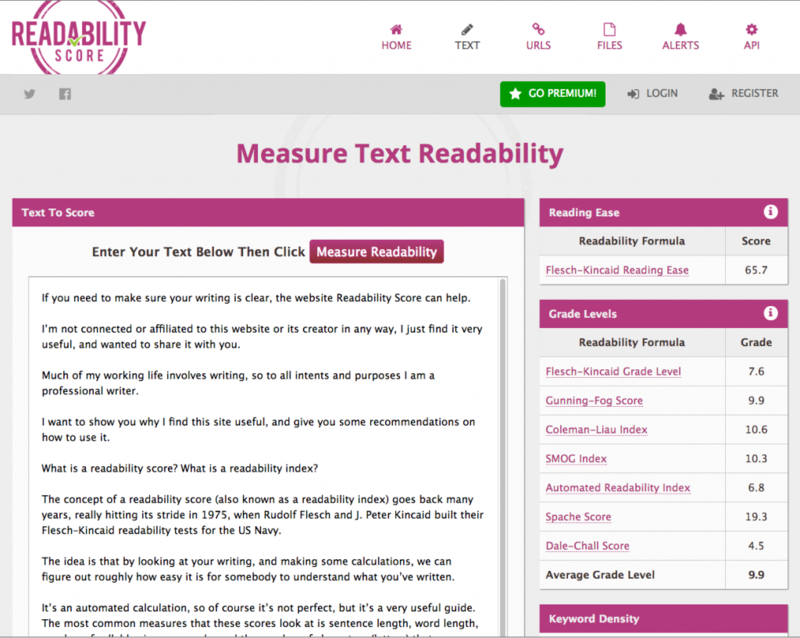 If you need to make sure your writing is clear, the website Readability Score can help. I’m not connected or affiliated to this website or its creator in any way, I just find it very useful, and wanted to share it with you. Much of my working life involves writing, so to all intents and purposes I am a professional writer. I want to show you why I find this site useful, and give you some recommendations on how to use it. 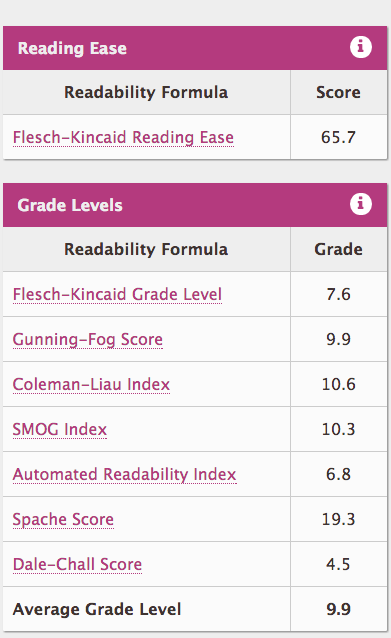 What is a readability score? What is a readability index? The concept of a readability score (also known as a readability index) goes back many years, really hitting its stride in 1975, when Rudolf Flesch and J. Peter Kincaid built their Flesch–Kincaid readability tests for the US Navy. The idea is that by looking at your writing, and making some calculations, we can figure out roughly how easy it is for somebody to understand what you’ve written. It’s an automated calculation, so of course it’s not perfect, but it’s a very useful guide. The most common measures that these scores look at is sentence length, word length, number of syllables in your words, and the number of characters (letters) that you use. Sometimes it’s difficult for a computer to count syllables accurately, so the measures are sometimes not 100% precise, but from a practical point of view that doesn’t matter. There are two basic types of measures. The first is just a score, which doesn’t mean much by itself, but can be used to compare one piece of writing to another. The second measure, which Flesch and Kincaid developed, and several others have followed, is more useful to us. It shows the average American school reading grade needed to understand your writing. What are the most popular readability scores? There are several readability tests that ultimately boil down to a US reading grade. This means that we can run several tests, compare them, and take the average. Here are the big guns of the readability index world. They all work in different ways, and the links below take you to Wikipedia articles so you can find out more. They produce results of a US reading grade that are usually no more than two or three grades apart. Spache Score – not particularly useful because it’s designed for writing aimed at children up to fourth grade. It can produce results way out of line with other methods, as you can see from the screenshots in this article. Dale-Chall Score – interesting because it contains a list of 3,000 words that American fourth-graders can understand, and considers any other words to be difficult. This website was built and maintained by Dave Child, who’s based in the UK. I don’t know him personally, but he’s very friendly and responsive to email, if you have feature requests, etc. The site is nice and easy to use, and looks good. You can either paste some text directly into the site (which is what I do), or upload files, or point the site to a URL web link that contains your text. The site can even monitor your links, such as your homepage, and alert you when certain readability thresholds are breached. The results are very clear and easy to see, and I’m sure you’ll find it very useful. You get to see the various reading grade levels for your writing, and an average. You also get keyword density, ie how often certain words or two-word phrases appear. Personally I don’t need this, but if you write with SEO in mind it can be helpful. Word count, sentence count, and average words per sentence are useful. I’ll give you some recommendations below for how you could use this. The longest sentence is a crucial metric, and one that I asked the site author to add for me. (Impressively he added it within a day!) You also get the longest word, which can be helpful too. If you are more than a casual user, there are very reasonably-priced subscription options, which help support the site. Even highly intelligent and/or educated people (not always the same thing!) find it easier to read and comprehend writing that is at a lower reading grade. So no matter who you are writing for, whether it’s doctors and lawyers, manual workers, or the fabled “high-school dropouts”, a lower score is usually better. In other words, the average reading grade in America is 8th grade level. I have no particular reason to doubt that the UK is very similar. Here’s a screenshot showing the readability scores for this very article you’re reading now. (Click the image to see a larger version.) What do you reckon? Must try harder! 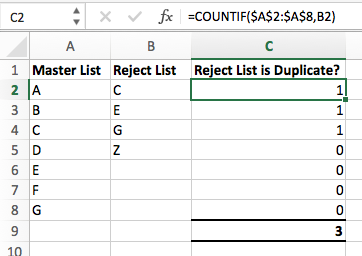 Use COUNTIF in Excel to quickly count how many values in one list appear in another. I recently had a Master List of email addresses, and another list of Reject email addresses that needed to be excluded from this (because we no longer wanted to email these people). The screenshot below shows my spreadsheet. I replaced the email addresses with simple letters here, to make it clearer to see what’s going on. I created three columns, for my Master List, my Reject List, and whether this row in the Reject List contains a duplicate. At the bottom I just did an Auto-sum. In this example, 3 rows are duplicates. Do you see something like this in your Evernote note? It means that you were using more than one device to edit your note, and you made changes before Evernote was able to synchronise the change. Here’s a couple of ways you might go about fixing this. DISCLAIMER: Although this has worked for me, you use it at your own risk! Take a backup copy of your note if you are concerned. If, like me, most of your notes are just lists of things, such as ideas for my next book, then this will probably work well for you. 1. Copy your entire note to the clipboard. 4. Copy the new text into your clipboard. This now has exact duplicate lines removed. WARNING 1: This will remove any formatting that you were using in the note. WARNING 2: Although this process doesn’t reorder your lines of text, because duplicate lines are removed you might find that lines lower down are no longer right next to the line they used to be next to. Personally, when I get a conflicting modification I just keep adding to the note at the bottom, and in practice this has never been a problem for me. PRIVACY: I didn’t write this site that I linked to, and I’m not connected with it in any way, I just found it online. I don’t know it stores your note text (theoretically it could), so you might not want to paste anything too confidential in there. If you are worried that you might lose text for some reason, you could always just copy all the text from your old note into a new note (ie duplicate the note) and just perform this procedure on the new note, so you’ve still got the old note as a backup. You’ll see that the “Conflicting modifications” notice is still in place; you’ll have to delete that manually. [The procedure above, which deletes duplicate lines] does not really help resolve the conflict, and conflicting lines may be physically separated. A much better method is to copy each section (that is from an original note) to separate files, and then use one of the many tools that show differences and allow merges. But what we really need is for Evernote to (1) prevent as many conflicts as possible; and (2) provide a tool to resolve the conflicts. He is of course correct on all counts. The procedure he describes is more suitable if your note is more detailed. It would likely take longer to perform than the simple method I showed above, and requires a little more technical skill, but could provide better results for you, depending on the content of your notes. So there’s a couple of choices, and I hope this helps you. If you watch a lot of online video, as I do in order to stay up to date on the latest technologies, you might find it useful to speed up the video so that you can get through everything more quickly and save yourself some time. To do this, I use a free extension for the Google Chrome web browser called Video Speed Controller. I find I can easily watch videos at 1.7x speed. This extension lets you go up in steps of 0.1x, so you can quickly speed up, slow down, and rewind 10 seconds when you need to. A little wrinkle: it only works on HTML 5 videos, not Flash videos. Still, it will serve you well most of the time, since Flash video is old now, and on its way out (arguably!). Over the last few weeks I’ve been getting a large number of spam emails from various friends who have had their email accounts hacked. The password has been guessed, and the attacker has sent emails containing spam links to everyone in the address book. Worse still, anyone receiving the email can see the email address of everyone else who received the email, so you are effectively having your address book opened up to the world! The solution is simple: make sure your email password is strong. I recommend the use of a tool such as 1Password, that will generate long, strong passwords for you, and keep them safe too, so you only ever have to remember one password. For more information, take a look at this classic article on how to choose a strong password. Author Ian HowlettPosted on August 24, 2015 August 24, 2015 Categories SecurityLeave a comment on Email accounts are being hacked! Make sure your password is strong! Thanks to the good old EU and it’s charming directives, UK law now requires websites to show a warning to the user if they are using cookies. This is the Privacy and Electronic Communications Regulations (PECR), and there’s specific cookie info here.